U: what an exciting week it has been! we got to go to cirque du soleil with your school on friday, it was amazing. you said maybe when you get older and very brave you will join the cirque- you want to be the sparkly silver guy that spun down from the ceiling. S: you are all "my do it" and sneaking cookies. screaming and "more snuggles, mama". you can get yourself dressed by yourself, including socks and shoes, and talk in complete sentences. you love to read books and listen to the same songs over and over. This is a perfect example of just making some art alongside the kiddos, even if I don't have the right supplies and a kid is climbing all over me. A wonky little spring paper cut to hang above the nature table in the kids room. I just watercolored some paper and cut it out with scissors. I didn't have the space or time to bring out the cutting mat and exact-o knife and to paint any paper the colors I wanted. I just used the scraps I had and made do, even if her eyes ended up being two different shades of brown! Just trying to make a little something. U: making potions in the backyard. S: feeding Uzi's baby seal and blowing bubbles. One of our favorite nature spots near Portland is Elk Rock Island, which is an island in the middle of the Willamette River in Milwaukie. It is a quick drive and a beautiful spot to explore with unusual terrain. The trail to the island is surrounded by cottonwoods, whose sweet scent fills the air in the spring. Access to the island depends on the river, and how high the water is. On every visit except this last one we have been able to make it across to the actual island, but even if you can't cross the river, there is still lots to see and do. It is great spot to watch the boats go by, throw rocks in the water, hike around the island, watch birds, collect cottonwood buds, scramble around on the rocks, pretend to go fishing, and look for frog eggs. If you have littler ones you do need to keep an eye on them, as you are surrounded by water and there are parts with steep drop-offs. But plenty of little ponds to explore and flat spots to play on. On the edge of the island there is a rocky beach which is a great spot to watch boats and throw rocks. Occasionally there are some sketchy people hanging out on the main trail and teenagers also come out here for some mild partying, but we haven't had any issues so far. We mostly seem to run into birders on our visits there. We like to visit frequently in the spring to check on the frog eggs, which everyone in our family finds very exciting. This week was so busy with birthdays and events, that I managed to take only a few photos. U: my six year old! always making something and full of so many ideas. S: forever with messy hair and boots, visiting her beloved chickens. I am hoping to document more of the art I have been making. 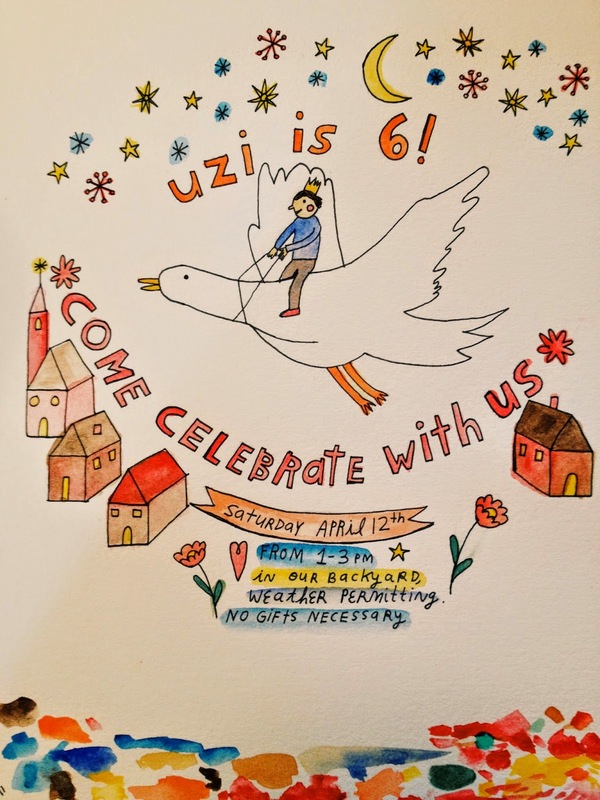 Here are two pieces I have recently finished, an invitation to a birthday party and a bigger piece that is for an auction for Uzi's old preschool. I often never think about photographing my art until the last minute, so I am going to try to take more photos of the process as well as the finished piece. I am always so rushed trying to finish and frame things, that taking photographs often feels like an afterthought that I don't have time for! Having the art show in January was a great incentive to get back to making art. I loved having a deadline, although the pace was not sustainable for me in my day-to-day life. I was literally spending every minute I did not have the kids with me making things for the show. I am trying to find small ways to incorporate making art into my day besides just drawing little sketches in my notebook. I do a lot of that, but it is hard to find the space and time for deeper work, like playing with my inks and watercolors and making more polished pieces. I often don't want to drag all of my materials out because the kids will get into it or as soon as I sit down after setting it all up, I will need to move on to something else more urgent. So I don't have any solutions just yet, but am going to make a conscious effort with it. As well as having some perspective and remembering that my little one will not be so little, and into everything, for much longer. U: we fulfilled one of your biggest dreams when we saw a real beaver in the wild. We watched it walk across the banks of the water and then swim out to the reeds. We could hear it splashing and chewing on wood out in the water. it was amazing! S: you stopped on the bridge to watch the two ducks sleeping. when you want me to pick you up, you say "mama hold you". a picnic amongst the magnolias! hoyt arboretum, portland. Last week was mostly stormy and rainy, but one afternoon the sun came out and we immediately grabbed some picnic supplies and headed up the hill to the arboretum in washington park. I had noticed our neighbor's magnolia tree was budding, so I thought it would be the perfect time to visit the magnolia section of the park. It was gorgeous, with almost all of the trees covered with blossoms or buds that were starting to open. It is hard to pick my favorite spring flowering tree, but magnolias might be it (dogwoods are a close second). We sat at the foot of a big hill and made a gigantic sandwich for our supper, and rolled and ran down the hill. We listened to the birds and enjoyed the sunshine and all the trees. We played with the gigantic magnolia leaves (which can make a lovely little hat). As the sun started to dip behind the trees, we shook our picnic blanket out and headed back to the trail for a little hike before getting the car. We might have to visit again in a couple weeks when the ground becomes a magic wonderland covered with petals, I think I have a kiddo or two who would enjoy that!